Update… Louise Zeitlin left me a comment, mentioning that this was an illustration by her father. I asked for more details and here they are. All my dad’s illustrations/book covers was under the name Lou Marchetti. My father was a cover illustrator from the 1950’s to the late 1980s, he died in 1992. Besides covers of the pulp fictions genre, he created a lot of covers for books having to do with Gothics, i.e., the cover usually had a young beautiful girl running from a mysterious house or castle, and the ever present light in the window (a feature many artists started adding in their covert art.) If you’d like to read more about my dad check ASKART.COM and put the name in “Lou Marchetti.” Thanks for your interest I really enjoy when people like my dad’s work. I have a lot of originals sitting here in my home at still at my mom’s house. Thanks again. Gah! I love your blog! Jennine- doesn’t she? 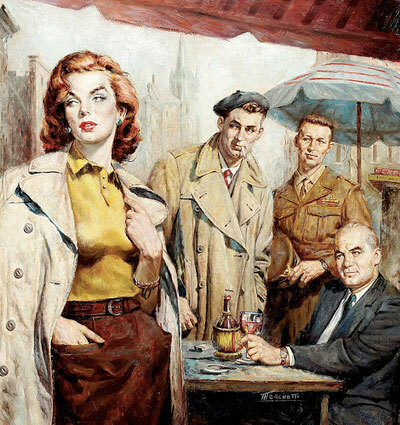 i don’t know if she is actually a “bad girl” and it’s funny i thought those guys were looking at here but check their eyeline, they’re not. but i LOVE her outfit and oversize looking trench. and Eline- alo! haha nice! much thanks. My father is the illustrator for this book cover. Louise, can you tell me his name?